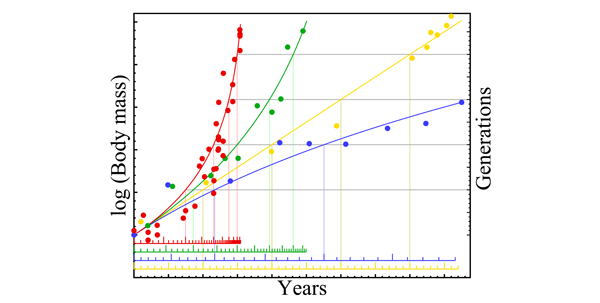 The log-linear trajectory of the exponential increase is thus found to be bend in physical time whenever the time-scale of natural selection is evolving with the evolutionary increase in mass, i.e. whenever τ• ≠ 0 and x ≠ 1. This bend is illustrated in Fig 1 together with fossil data for four scale dependent bending exponents. When the rββ/rα-ratio is zero (blue curve), net energy and mass is increasing exclusively from an exponential increase in resource handling, and the generation time is evolving only by mass-rescaling with an allometric exponent of 1/4 (2D) or 1/6 (3D). This increase in the generation time with mass is dilating the time-scale of natural selection, and slowing down the increase in mass in physical time, with a downward bend trajectory that is identified by a dw/dt exponent (x) of 3/4 in 2D and 5/6 in 3D. Fig. 1 Evolutionary bending by natural selection dilation (blue curve) and contraction (red and green curves) of natural selection time. Illustrated together with body mass data from the fossil record (dots). For curve explanation see the text, and for data examples see the next four sub-sections. The figure is elaborated from Witting (2016). At the other limit where the rββ/rα-ratio is approaching infinity (red curve), net energy and mass is increasing exclusively because of metabolic acceleration. The time-scale of natural selection is then contracting with a τ• exponent of -1/2 in 2D and -2/3 in 3D. This is accelerating the increase in physical time, with an upward bend trajectory that is identified by a dw/dt exponent (x) of 3/2 in 2D and 5/3 in 3D. In between the two limits, there is a slightly upward bend trajectory (green) when the rββ/rα-ratio is unity and resource handling and metabolic pace are equally important for the exponential increase in mass. And a log-linear trajectory (yellow) when there are no evolutionary changes in time, which is the case when the rββ/rα-ratio is 1/(2d-2). These four bending cases represent expectations for different modes of selection, and this is discussed and compared with fossil data in the next four sub-sections.